High Court judge Justice Thushara Rajasinghe will deliver his judgment on the Fiji Times alleged sedition case on Tuesday after the unanimous not guilty opinion of the three assessors yesterday. After the assessors delivered their opinions, Justice Rajasinghe acknowledged them for their time and dismissed them from their duty accordingly. In a lengthy summing up before the assessors retired to deliberate, Justice Rajasinghe reminded them to apply directions of the law when reaching an opinion. He told them to determine the facts based on the evidence presented during trial and to disregard anything they had heard from outside the courtroom. He stressed that it was pertinent that they exclude any external influence when deliberating. Justice Rajasinghe told the assessors that he was not bound by their opinions. However, he would give them the greatest weight. 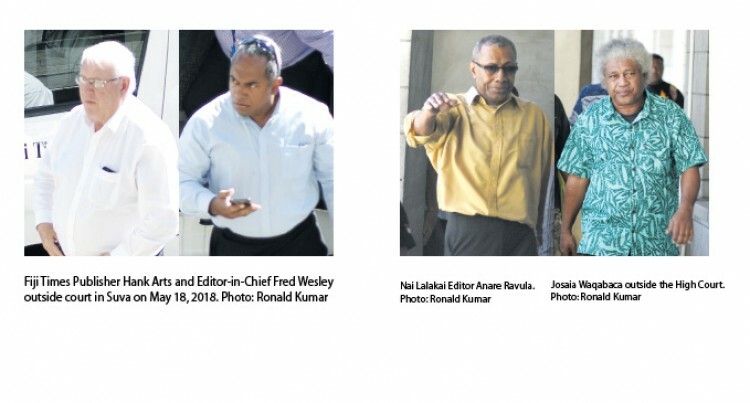 He said Nai Lalakai Editor Anare Ravula, Fiji Times Editor-in-Chief Fred Wesley, Publisher Hank Arts and the company all claimed that they had no knowledge about the alleged seditious letter thus claim that they had no intentions. Justice Rajasinghe said the purpose of the offence of sedition was to prevent any unlawful attack on the tranquillity of the State. However, he said, it was not necessary at all that the act was followed by public disturbance. Nonetheless, the assessors were told to consider the reaction of the readership of the Nai Lalakai. Justice Rajasinghe told them to carefully scrutinise the evidence given by the witnesses and it was up to them to consider part of the caution interview, all of it or disregard it in whole. He encouraged them to determine the alleged seditious letter in the spirit of freedom and not through the narrow eyes of criticism. They were told to look at the letter with a free, fair and liberal view. While highlighting the evidence of the Permanent Secretary of iTaukei Affairs Naipote Katonitabua, Justice Rajasinghe said the ministry consulted with iTaukei elders within the iTaukei communities whom they regarded as the real stakeholders. He said during the ministry’s consultations they received feedback from members of the communities about land and ethnicity issues which were published in the Nai Lalakai. Mr Katonitabua said indigenous Fijians had access to electronic social media. However, the elders relied on the Nai Lalakai for their information. The court heard that members of the iTaukei community would circulate the Nai Lalakai among themselves during social or family gatherings. Mr Katonitabua said the iTaukei communities did not consider the letters in the Nai Lalakai as opinions, rather they considered it as facts. When questioned about the delay in reporting the matter to the Police on June 28, 2016 which was two months after the letter was published on April 27, 2016, he testified that he had to attend to issues within the ministry which were more important than the letter. He also testified that the Nai Lalakai had the ability to cause instability in the country. Subsequent to reporting the matter to the Police, Mr Katonitabua said the relationship between the ministry and the Nai Lalakai improved. Justice Rajasinghe said the Investigating Officer Inspector Esili Nadolo had testified that he had interviewed Nai Lalakai column writer Josaia Waqabaca in iTaukei on July 14, 2016, and he was very co-operative. He said he never got a copy of the petition addressed to the Attorney-General neither did he receive any complaints from the A-G’s Office about the letter. He further testified that apart from the complaint lodged by the PS, he did not receive any reports about public disorder or communal antagonism in Fiji. Inspector Nadolo also said in evidence that there was no investigation to establish whether Arts could speak, read or understand the iTaukei language. He also said there was no investigation into whether Wesley and Arts had ever seen the letter or a copy of it before it was published. In his evidence, Wesley said if he had doubts about a letter he would either refer it to their legal team or he would not publish it at all. He said even when he gets a response from the lawyers he still had the discretion to drop the letter if he was still not comfortable about it. Wesley testified that he does not read the iTaukei language nor had ever read the Nai Lalakai. He said the first time he learned about the letter was when he was arrested by the Police. He claimed that he never authorised the publication of the letter. Justice Rajasinghe reminded the assessors of Wesley’s evidence that he was not aware that Waqabaca was a regular contributor to the Nai Lalakai. System and Network Administrator Niraj Maharaj said in court that during a search on Ravula’s computer he found the letter saved in a word file. He said he conducted similar search on Wesley and Arts’ computers however he found nothing. He also testified that he did not obtain Ravula’s permission to search his computer rather he went by the directive given to him by his Manager. Nai Lalakai Layout Artist Viliame Ravai testified that he only laid out content, which is approved by Ravula. Nai Lalakai Acting Editor Unaisi Ratubalavu said she knew Waqabaca because she had previously dealt with a few of his letters and had edited some of it because it contained sensitive issues. She said as the Acting Editor she would email a summary of the contents of the Nai Lalakai to Wesley every Tuesday from the first page to the last page. She testified that neither Wesley nor Arts had any involvement in the letters to the Editor section of the Nai Lalakai. Justice Rajasinghe told the assessors to disregard the opinions of Fiji Times witness Paul Geraghty about the evidence given by the Prosecution witnesses. The court also heard the evidence of lawyer Richard Naidu who said he provided training to journalists of Fiji Times on issues pertaining to the media and their work. Justice Rajasinghe said the Prosecution’s case was based on direct, circumstantial and also documentary evidence. He invited the assessors to determine the credibility, reliability and the truthfulness of the evidence presented in court. Bail for all accused men has been extended.